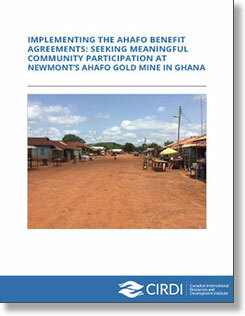 In 2008, ten communities in the Brong Ahafo region of Ghana entered into agreements with Newmont Ghana to govern company-community relations, ensure local job creation, and share the benefits of the company’s mining operations. Ten years later, this report looks at the communities’ experience of those agreements and suggests how the agreements might be improved. Though the agreements were celebrated for their attempts to include all stakeholders in decision-making, challenges remain around representation, consultation, and participation. New entities established to facilitate multi-stakeholder decision-making have led to the replication of existing power imbalances. And despite many improvements, the agreements have not fully stabilized company-community relations; tensions and grievances remain concerning employment, compensation, and resettlement, among other issues. The report makes research-informed recommendations for the communities, Newmont Ghana, and other stakeholders in the lead-up to the renegotiation of the agreements. Authors: Benjamin Boakye (Africa Centre for Energy Policy (ACEP)), Maggie Cascadden (Simon Fraser University (SFU)), Jordon Kuschminder (Independent Social Performance (ISP)), Sam Szoke-Burke (Columbia Center on Sustainable Investment (CCSI)), and Eric Werker (Canadian International Resources and Development Institute (CIRDI) and Simon Fraser University (SFU)).